New!! We now have Message Board! Click on the link and it will take you to it. You will have to register with the board. Recipe of the week is at the "favorite recipes" link. More recipes are at the message board. CHECK IT OUT!! 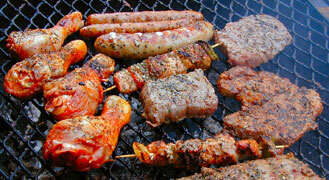 Thank you for visiting "Perfect Backyard Grilling"!! I have created this site because there don't seem to be very many where people can share grilling ideas, homemade grill recipes, cook-out and party experiences, product opinions and many other things dealing with backyard grilling. I would like to build a friend membership (free of course) of members I can post on the site. I once I get some friends on board will be looking to see and taking suggestions on what will be the best way to improve the site by either adding a Message Board, Chat Room, ect. My mission for this site is for people to be able to do such things mentioned above and make new grilling friends male or female that love to spend their days outside on the porch or deck, in a gazibo, or just out on the grass spending time with family, watching sporting events, or just kicking back in a nice quiet place to enjoy the best type of food in the world, GRILLED!! Probably like you and everyone else, I don't have the time I would love to have to enjoy all these things but make the time as much as possible. Like you, I'm always open to suggestions whether it is grilling foods and techniques, party hosting ideas, ect. and I plan with your permission of course post ANY ideas on the site, turn people onto each other that want contact with each other, post first names and locations and any other information you'd like posted along with that and just have a friendly, family oriented site. Please click on "contact" link at the top of the page and let me know you at least stopped by. I will not respond to your email unless you specify you want me to and you want to become a member of the site. This website is brand new and still under construction so come back and see how it changes. I'll be updating this site when possible. I want it to remain as up to date as I can. My Grill! It is a BRINKMANN Pro-Series 7541. It's a great grill and I love grilling with it. It has a larger grilling area than alot of other grills 2 and 3 times more in price than it. I also have a older gas grill I converted to a charcoal grill. I will also use on occasion a gas deep fryer and a gas fish cooker(mostly used for boiled peanuts). script language=java-script type="text/java-script" src="http://ss.webring.com/navbar?f=j;y=lovetogrill;u=defurl"> Powered by WebRing.